Behold, a woman of the city, who was a sinner, when she learned that he was reclining at table in the Pharisee’s house, brought an alabaster flask of ointment… (Luke 7:37 ). Luke begins this little story with the striking phrase, “Behold, a woman…” There is a call to “Behold! Take notice of this!” followed by a remarkably vague description of, “a woman.” I’m not even going to tell you her name. I, Luke—the careful, technical historian who details geographic locations or political titles just to remind you how real all this history is—will not mention this woman by name. All you need to know is that she was well-known in her own community as a sinner. 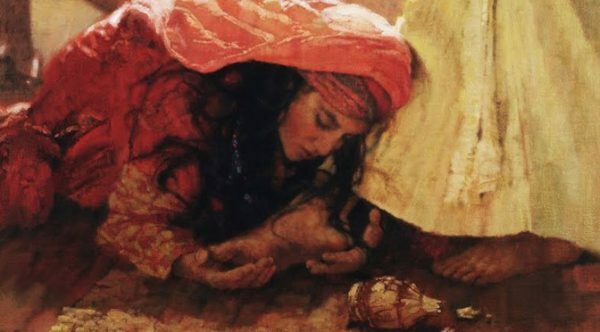 Oh, and you need to know that she somehow shoved her way into a private dinner just to bring her most treasured possession to Jesus, and then give Him a foot-bath with it! We are told to take note of this unnamed woman who approaches Jesus, in someone else’s house, with what is probably her life’s savings (it has been estimated that a stone jar full of perfume would be equal to about 20 months’ wages). Pay attention! Not to the august, socially-climbing, well-respected religious leaders who had Jesus over for dinner but to the nameless prostitute who is humiliating herself by coming in uninvited to wash Jesus’ feet with her tears, her hair, and her life-savings. This is not an everyday currency that this woman is bringing to Jesus. Although Luke won’t tell us her name, he does specify the precious gift she brings Jesus. He does this so we can appreciate this event which was like cleaning the mud off Jesus’ feet with $5,000 bills (what, you didn’t know $5,000 bills existed? They do. They have James Madison, the fourth president on them). That’s the point really—this is not an everyday currency that this woman is bringing to Jesus. You didn’t go to the grocery store in Jesus’ day to buy bread and milk, and then pay with an alabaster box full of precious perfume! This was a commodity, a treasure, perhaps even an heirloom. Behold this woman! Her name isn’t important, but what Jesus says to her and about her is. Simon, religious leader, and theologian, not only doubts the woman but Jesus. He thinks to himself, “If Jesus were a prophet, he’d know this woman is a sinner.” Jesus, reading his thoughts and proving He is a prophet, explains to Simon in essence: Jesus does know this woman is a sinner; the problem is that Simon doesn’t know that Simon is a sinner! This woman’s grief over sin and love for Jesus is evidence that her sins have been forgiven. Simon’s disregard for both her and Jesus is evidence of his hardheartedness and self-righteousness. Her overflowing love is a result of her experience and apprehension of grace. A very religious or morally upright person can be stone cold in the presence of Jesus because down deep they don’t think they’re really that bad a person after all. Jesus then turns His attention directly to this sinful, repenting woman, and assures her that her sins have indeed been forgiven. Through her faith in Jesus, she has been saved. What about us today? Which person describes our affections, pursuits, or delights? A very religious or morally upright person can be stone cold in the presence of Jesus because down deep they don’t think they’re really that bad a person after all. But the one who has experienced grace, who has been forgiven much and is overflowing with love for Jesus, is ready to worship Him shamelessly and publicly. May we behold this woman and learn an invaluable lesson from her very valuable gift to Jesus. Those who have been forgiven much, love much. Are you perfuming Jesus with your praise?